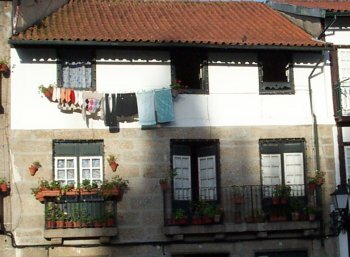 The historic centre of Guimarães is known for its medieval building techniques, that have been transmitted to the Portuguese colonies. This well-preserved town shows the evolution of this techniques from the 15th to the 19th centuries. Guimaraes played an important role in the formation of Portugal in the 12th century. The region was given as a feudal property to the family that created the country in the 12th century. In 1139 Count Dom Afonso Henriques declared the independence of Portugal from León and took the name of Afonso I as the first king of the new kingdom. 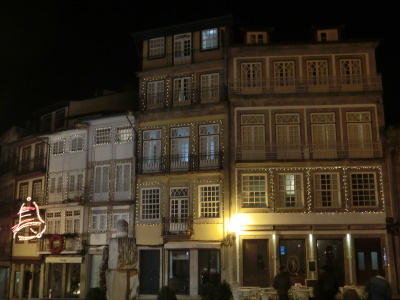 I didn't know what to expect of Guimaraes, and my first evening (when it was raining) I walked around town a bit lost. What a difference the next day was! 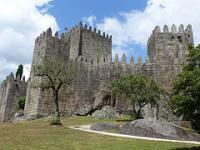 The sunny Sunday morning started with a walk to Guimaraes castle. Although totally empty and crumbled down on the inside, the view of the outside is very picturesque. After that I went to the small but very distinctive historical city center. You see a lot of wooden balconies and azulejos here. For today's visitors, it is not immediately apparent that Guimarães played such a significant role in Portuguese history, it is closely related to the foundation of the Portugal and is often referred to as the "cradle of the nation". The Castelo de Guimarães is said to be the birthplace of the first king of Portugal, Alfonso Henriques. Thus it's a good idea to refresh your knowledge about the origins of the Portuguese nation prior to the visit. If not, you can learn the most important facts in the small exhibition at the Castelo. They show also a copy of the Manifestis Probatum, the papal bull in which Pope Alexander III recognized the Portuguese king and confirmed the independence of Portugal from the Kingdom of Castile. The castle looks just like one imagines a medieval castle: a central keep surrounded by a ring of high walls and eight crenellated towers. 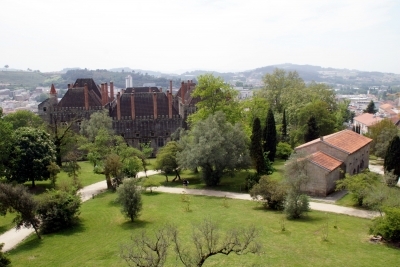 You can walk on top of the wall around the entire castle, the photo shows the view to the two other buildings in the small park, the Paço dos Duques de Bragança and the Igreja de São Miguel. 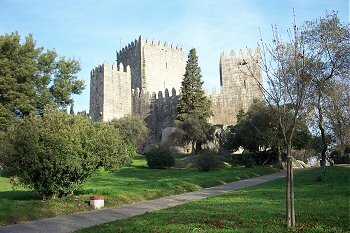 The Bragança Palace was built in the 15th century and was for several decades the residence of the Dukes of Bragança until they moved to Vila Viçosa. The Palace has a quadrangular plan and is built strictly symmetrical around a large courtyard, most striking are the high brick chimneys and the sloping roofs. The interior is rather austere and simple. Parts of the building house a musuem with historic furniture and decorative arts, not really exciting, remarkable are the large tapestries. The role in Portuguese history is only one criterion why Guimarães was inscribed on the WH list. Other criteria were that it is "an exceptionally well preserved town, (that) illustrates the evolution of particular building types from the medieval settlement to the present-day city" and that "specialized building techniques developed there in the Middle Ages (and) were transmitted to Portuguese colonies" (cited from the Unesco website). And these are exactly the aspects that make the special charm of this WHS. After having visited the palace and the castle, I strolled through the narrow streets of the historic centre, enjoying the city and its atmosphere. I liked that it was not overcrowded with tourists, it's a lively small town, souvenir shops for tourists and normal stores for the locals side by side. The town centre has preserved a harmonious architecture and design: small, old houses, arches spanning the narrow streets, most of the houses with wooden balconies or wrought iron balustrades. This can best be admired in the Rua de Santa Maria and the central square, the Praca de Sao Tiago. The most striking individual buildings in the core zone are the Igreja de Nossa Senhora da Oliveira, the former Convento de Santa Clara (today the Pálacio de Justiça), and the remains of the city wall along the Av. Alberto Sampaio. 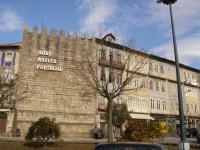 I spent half a day and an evening in Guimarães, I stayed there overnight. That's enough time to properly visit this WHS. Guimarães can also be easily visited as a day trip from Oporto, if you are traveling by car it can be combined with a visit to the TWHS Bom Jesus de Monte in Braga. I visited Guimarães from Porto. Just a day trip. It was one of the many UNESCO sites I would visit this road trip. I loved the place! It was a Sunday and very quiet but made it easy for photography. Parking you can do best at the castle and from there walk to the palace of the dukes, then continue to Olive Square. Then circle back wandering the small streets with the medieval half wooden houses. Highly recommended!! A photo gallery you can see on the link. We stayed one night in Guimarães in October 2015, which was quite sufficient for this small town. I chose nice hotel within the old city walls called the Toural. The town's castle dates back to the tenth century, and still stands solid and imposing at the town’s highest point. They don’t charge an entrance fee to get in, and you can appreciate some pleasant views of the hilly surrounding countryside. The town’s medieval quarters have remained largely unchanged since they were built. The Portuguese are keen on colourful tile patterns, as we saw the next day at Porto’s famous São Bento station. The Portuguese national identity isn't something that has much significance to me – I had only ever visited the country once before! But it was nonetheless a pleasant, relaxing place to visit, and an opportunity to sample ‘small-town’ Portugal – as opposed to the big-town bustle of Lisbon and Porto. I visited this WHS in August 2014. I spent 2 nights here and I wasn't disappointed. Guimaraes has quite a lot to offer for those who decide to visit at leisure. 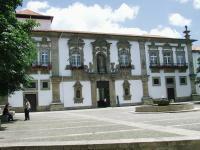 The Guimaraes castle is one of the main landmarks (free entrance) together with the Oliveira Square and Toural Square. I was lucky enough to visit on the first Sunday of the month which meant that the Palace of the Dukes of Braganza was free too. Moreover, there was the local parish feast when I visited which meant that the main churches were in tiptop condition and fully lit. My personal favourite was the Church of St Francis with its over-the-top interior. Other interesting features in Guimaraes were the five Stations of the Cross to be found around the town, the church of Our Lady of the Olive Tree and the Santa Clara convent. Guimarães is all up and downs, hill after hill. It is very beautiful and it whispers the stories of old times. The sidewalks are decorated with stones, many different colors and figures. For finnish people, it is funny to see flags -very similar as finnish flag- hanging all over the old town. This blue crossed white flag is the old Portugese flag from the time of kindom. As you enter Guimarães, a small historic town in northern Portugal near Porto, you may think this is just a normal Portuguese old town until you see a huge inscription “AQUI NASCEU PORTUGAL” on the building which means “Here is the birthplace of Portugal” then you know this town is quite special (at least). Guimarães is associated with Portuguese first true king, Afonso Henriques who drove the Moors out of Tejo river area which is now central Portugal. His castle on the hill above the old town is quite spooky with many turrets but enchanted by medieval felling. Near the castle is the recent restored Ducal Palace or presidential palace which is famous for it chimneys, however it is not interesting compared to the castle since it is just a big manor. The old town is a very pretty medieval quarter with many colorful balconied houses and nice churches. The symbol of the city is its unique 14th century town hall which was constructed on many pillars. My favorite is Igreja de Sao Gualter with its beautiful façade and lovely esplanade in front of the church. Guimarães is a nice lovely town and very important for Portuguese; however, for foreigner like me this town is not special as I had expected. The town is so small and I spent only half day to see all attractions. I did not conclude that Guimarães is not a good place, the town is beautiful but when compared to Porto or Braga, Guimarães is just a second rate tourist attraction. 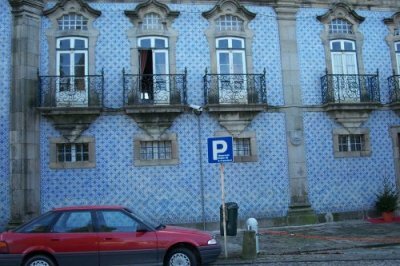 But if you want to see the Aqui Nasceu Portugal and appreciate the meaning of the Portugal state seal which is on the back of Portuguese euro coin, Guimarães is the place and local people will proudly explain the meaning to you as it associated to their lovely homes. From Porto central station, there are many trains go to Guimarães making a perfect half day excursion from Porto. Famous tapestries: Palace of the Dukes of Braganza: "In its vast collection, are the tapestries of Pastrana, which narrate some of the events in North African conquests, attributed to Nuno Gonçalves ... and a collection of Flemish tapestries by Peter Paul Rubens, among others"
197 Community Members have visited.